Letterhead, envelopes, business cards and the other frequently used stationery items are a cornerstone of our new visual identity and play an important role in making our brand recognizable. Displayed below are samples for several stationery items. The layouts are clean and open and feature our defined colors, typefaces and logo. Templates in various sizes have been provided for use in desktop applications as well as professional printing. In order to maintain consistency across all applications, please follow the specifications listed within each template. Templates are provided in US Letter and A4 sizes. Your local printer can use one of the provided InDesign templates or PDF files to print blank letterhead sheets that include the Xylem corporate address or the address specific to your Growth Center. Microsoft Word templates have also been provided. The templates labeled “customize” allow for customization of local addresses. Use these templates to output your letter on your office printer or to send it electronically. 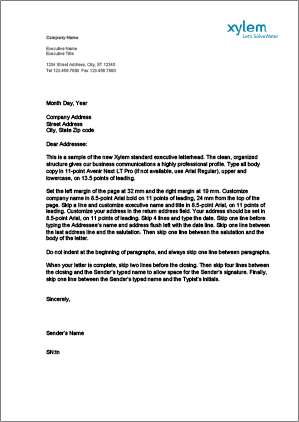 The templates labeled “imprint” allow you to type your letter and output it on pre-printed letterhead. Templates for second sheets are also available. Templates are provided in #10 and DL sizes. 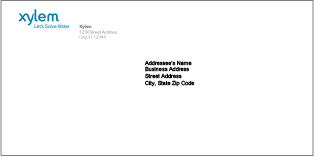 Your local printer can use one of the provided InDesign templates or PDF files to print blank envelopes that include the Xylem corporate address or the address specific to your Growth Center. Microsoft Word templates have also been provided. The templates labeled “customize” allow for customization of local return addresses. Use these templates to output your envelope on your office printer. 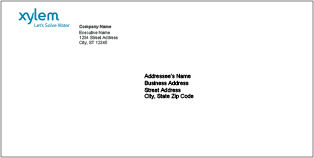 The templates labeled “imprint” allow you to input a mailing address and output it on a pre-printed envelope. The paper we print our stationery on should be considered as carefully as its design. In order to be environmentally conscious, we have chosen a FSC Certified line of papers with a high post-consumer waste content. Recommendations for paper stocks are listed below. The preferred paper for our stationery is Neenah Environment (FSC Certified, 20% FSC Certified fiber 80% post consumer), Ultra Bright White. For business cards, use 100 lb (270 g/m2) cover. 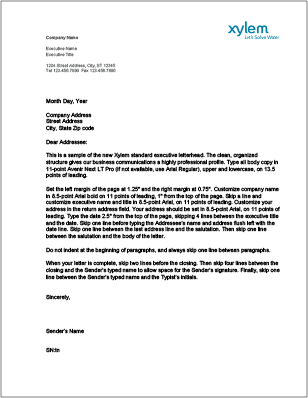 Letterhead and envelopes should use 24 lb (90 g/m2) writing. Our recommended paper for business card and stationery is uncoated, therefore the Xylem logo should be printed in Pantone 7460 U instead of Pantone 7704 C, the color used on coated paper stocks. Neenah Classic Crest Avalanche White can be used as an alternative if Neenah Environment is unavailable. Use 100 lb (270 g/m2) cover smooth for business cards and 24 lb (90 g/m2) writing for letterhead and envelopes. Take 2 offset is the top option in other regions, such as Europe. Naturalis smooth finish and Revive offset can be substituted. Use comparable weights and bright whites. Additional customizable Microsoft Word templates have been created for Xylem executives to use. 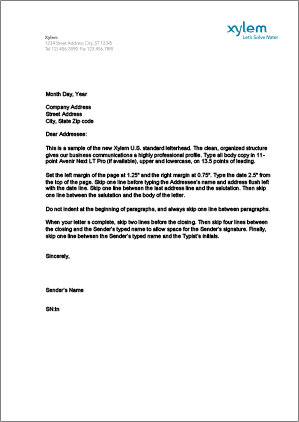 These templates are identical to the other letterhead and envelope templates provided on this site, but include areas allowing the executive to add his/her name and title. In order to maintain consistency across all applications, please follow the specifications listed within each template. Templates are provided in US Letter and A4 sizes. The templates allow for customization of local addresses and addition of executive name and title. 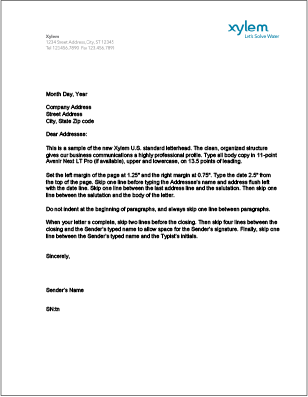 Use these templates to output your letter on your office printer or to send it electronically. Templates are provided in #10 and DL sizes. The templates allow for customization of local return addresses and addition of executive name. Use these templates to output your envelope on your office printer.